St Michael’s Church has exerted great influence on developments in architecture. The complex bears exceptional testimony to a civilization that has disappeared. These two edifices and their artistic treasures give a better overall and more immediate understanding than any other decoration in Romanesque churches in the Christian West. The ancient Benedictine abbey church of St Michael, built between 1010 and 1022 by Bernward, Bishop of Hildesheim, is one of the key monuments of medieval art. Of basilical layout with opposed apses, the church is characterized by its symmetrical design: the east and west choirs are each preceded by a transept which protrudes substantially from the side aisles; elegant circular turrets on the axis of the gable of both transept arms contrast with the silhouettes of the massive lantern towers located at the crossing. In the nave, the presence of square impost pillars alternating in an original rhythm with columns having cubic capitals creates a type of elevation which proved very successful in Ottonian and Romanesque art. St Mary’s Cathedral, rebuilt after the fire of 1046, still retains its original crypt. The nave arrangement, with the familiar alternation of two consecutive columns for every pillar, was modeled after that of St Michael’s, but its proportions are more slender. The church of St Michael and the cathedral contain an exceptional series of elements of interior decoration that together are quite unique for the understanding of layouts used during the Romanesque era. First come the bronze doors dating to 1015, which retrace the events from the book of Genesis and the life of Christ, and the bronze column dating from around 1020, the spiral decor of which, inspired by Trajan’s Column, depicts scenes from the New Testament. There are some significant things to be found in Hildesheim. The church of St. Michael (seen in the image) was the model that was used by many Romanesque churches and cathedrals throughout Germany and Europe. Like Würzburg Palace, both churches in Hildesheim were gutted by bombs during WWII. The St. Michael’s you see today is very different than the church which existed before the war. Over the centuries, St. Michael’s had parts of the original Romanesque building removed and parts of other styles were incorporated into the design. After the war the decision was made to restore St. Michael’s to its original Romanesque design from the 11th century. Oddly enough, the wooden ceiling in St. Michael’s is the original wood ceiling. It is a beautiful design that looks like it has undergone serious renovation. In reality, the only work done on it was scrubbing off a layer of grime. St. Mary’s Cathedral was under renovation when I was there (a common thread in my travels) but the 1,000-year-old column, chandelier and bronze doors were all on display in other churches or museums in town. The cathedral is scheduled to reopen on August 15, 2014. 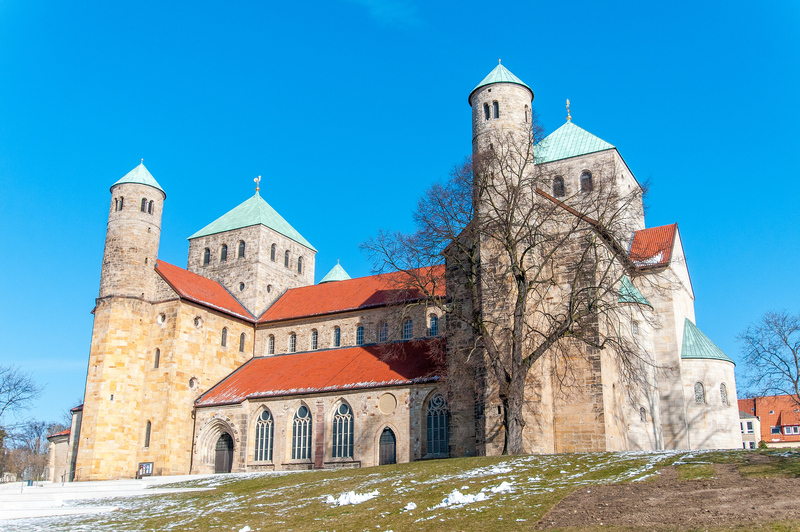 The St Mary’s Cathedral and St Michael’s Church at Hildesheim is a cultural UNESCO World Heritage Site in Germany. It was inscribed in 1985 for its cultural value and significance. It is a Roman Catholic Church that features a combination of Gothic, Romanesque, and Baroque architectural style. To this day, the church is still in use. The groundbreaking of this church was in the 1110s. These two churches that form this UNESCO site are two inseparable monuments – hence, they are named as one UNESCO site. These monuments serve as testimony to the religious art established by the Holy Roman Empire in this part of Germany. 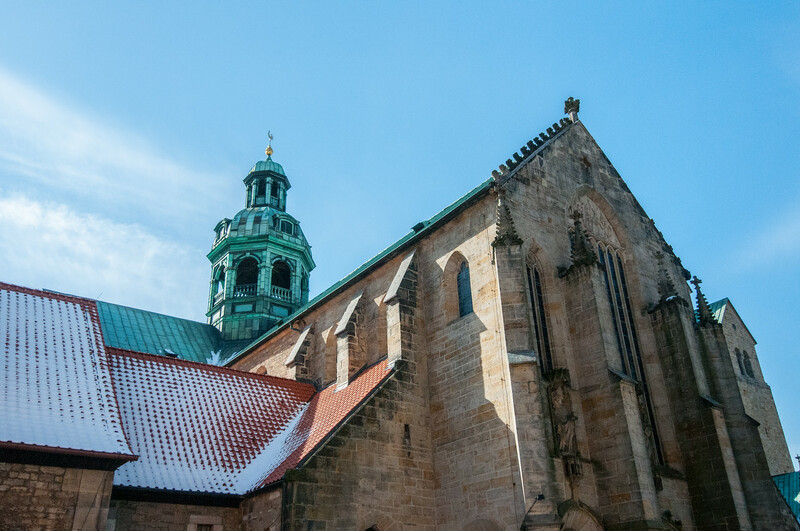 The St Mary’s Cathedral and St Michael’s Church at Hildesheim is a monument that is of essence to the religious and architectural landscape of the city. In order to fully understand their value, it is important to look into each component of this site and what their significance is. St. Mary’s Cathedral, also known as the Cathedral of the Assumption of Mary, is a medieval Roman Catholic Church. 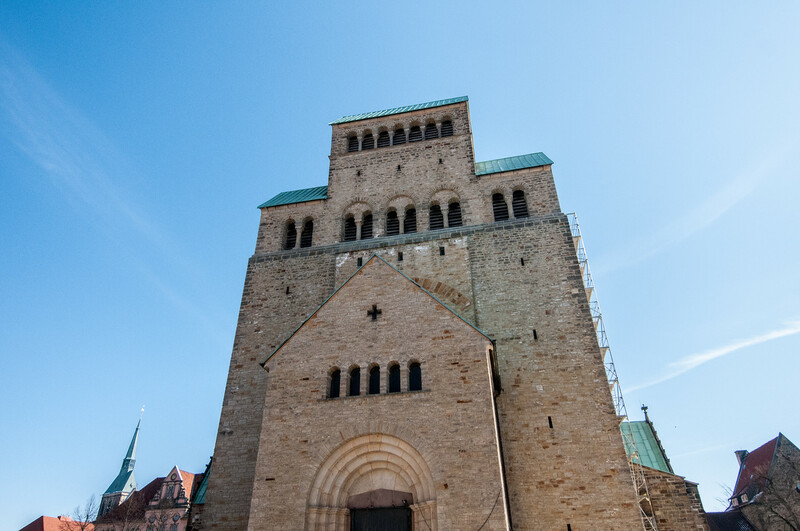 It was built at the center of Hildesheim and is located close to St. Michael’s Church- the other half of the UNESCO site. It was built sometime in 1010 to 1020 while featuring a Romanesque architectural style. The cathedral features a symmetrical plan and consists of two apexes. This is a common feature found in Ottonian Romanesque architecture during the Old Saxony period. There are several treasures that are housed within this cathedral including bronze works, world-famous artworks, Romanesque wheel chandeliers, Azelin chandelier, and Hezilo chandelier. From the 11th to the 14th centuries, there have been numerous renovations and extensions that were done on St. Mary’s Cathedral. An air raid in March 1945 completely destroyed the cathedral. It was rebuilt from 1950 to 1960. Meanwhile, further renovations were done in 2010 as part of the conservation measures. 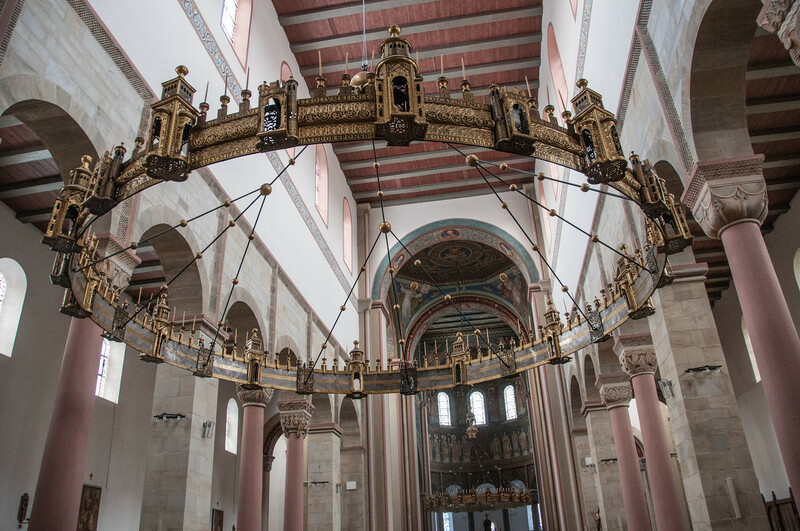 The St. Michael’s Church is one part of the UNESCO site St Mary’s Cathedral and St Michael’s Church at Hildesheim. It is an early Romanesque church that was founded in 1010. It was founded by Bishop Bernward. The church is notable for its painted ceiling. Meanwhile, the church was once the location of the bronze Bernward doors that are now relocated to the St. Mary’s Cathedral. Currently, St. Michael’s Church is a Lutheran church. It is considered one of the most important churches from the early Christian period, architecture-wise. Many of the religious items from these cathedrals were transferred to and currently displayed at the Metropolitan Museum of Art in New York following the 2010-2014 renovations. I’m Making the Jump to Print: Say Hello to the New Staff Writer for Newsweek Magazine!